Here are some images from one of my family photojournalism sessions. If this gorgeous family didn't all look alike, you'd think they were a bunch of models I assembled in a casting call. "Here she goes showing favorites again. I'm sittin' right here, Ma!" The grand matriarch being attended to by her clone. 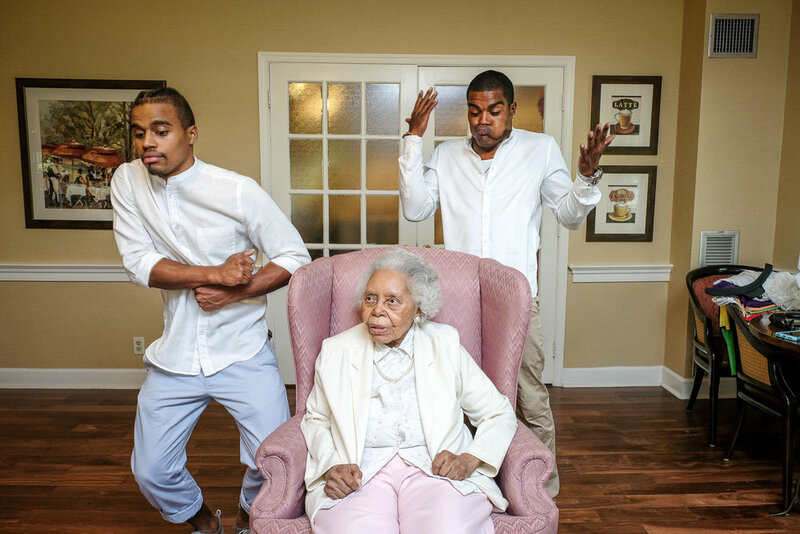 Gettin' down with grandma. Go 'head, fellas! Break it all the way down! The queen and her princes. Look at that face! Even the family dog is gorgeous! Let's take the party outside. Tell me this family doesn't belong on the covers of Essence AND Ebony magazines. Don't know how well they know their hip hop history, but they certainly channeled a Kid N Play photo from back in the day. What the heck, let's make it a trifecta and put them on the covers of Ebony, Essence, and Jet. This post is an example of Family Lifestyle Photography, which is a contemporary spin on the traditional family portrait. There's no need to make a grand, complicated production out of taking family photos. Those kinds of photos don't even reflect what your family really looks like. Family Lifestyle Photography is about capturing the awesome images that occur during the course of everyday family life.